Peppa Pig and friends are back in the brand new live show Peppa Pig’s Adventure! 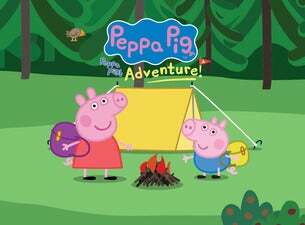 Join Peppa as she gets ready to go on an exciting camping trip to the woods with George and her school friends, including Pedro Pony, Suzy Sheep and Gerald Giraffe. With lunch-boxes packed and Daddy Pig driving the bus, Peppa and friends are excited about their outdoor adventure, full of games, laughter and live music! The happy campers soon settle down to sleep and listen to the gentle pitter patter of rain. Safe and warm inside their tents the excited group can look forward to morning time, when there will be lots of muddy puddles to play in!